The Organ Pipes National Park is just off the Calder Freeway in Keilor North, approximately 20km north-west of Melbourne. A remnant of our volcanic history, the park covers 121 ha and was created in 1972 from what was weed-infested farmland. A large number of volunteer hours have gone into the park with the aim of restoring the area to resemble its condition prior to European settlement. The park is well signposted from the Calder Freeway and wasn't hard to find. Near the carpark are handy facilities - picnic tables, toilets and a visitor centre. While the visitor centre was not open when we were there, you could still wander through the open display area. From the carpark it's quite a steep walk down a sloping track to view the organ pipes. There's a great view across the valley on the way. There's also a lookout walk which is accessed from the back of the visitor centre. Basalt columns formed by the cooling of volcanic lava, the pipes are quite spectacular to look at and of course a great photographic opportunity. A U-turn and a bit more of a walk brings you to the Rosette Rock. 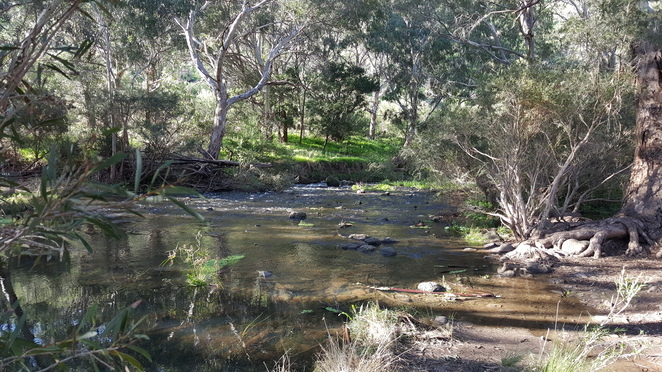 One of the highlights for us was Jacksons Creek babbling alongside as we walked through the park. This creek is in itself an attraction, the pristine water and surrounding trees adding a real countryside charm to the environment. The only odd note is the planes flying quite low overhead as the airport is nearby. If you're a plane spotter however, that's probably a sightseeing benefit. 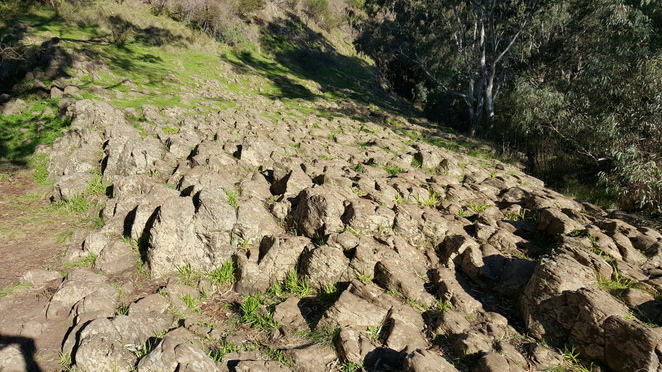 Furthest down the track is the Tesselated Pavement, which is apparently the tops of basalt columns that have been worn away by Jacksons Creek. In the valley there are a few more picnic tables scattered about and another set of toilets. We enjoyed our visit and it occurred to me that it would be a good place to take overseas visitors with limited time for a small taste of the Australian bush that is very close to the airport. Overall we found it to be a great place for a walk, some interesting sightseeing and a good picnic spot (note that they don't have any rubbish bins so be prepared to take your rubbish with you). The park boasts abundant birdlife and you may even spy an echnidna or wallaby. You'll also get some good exercise walking back up the hill to the carpark. For more information about the park and its walks see the Parks Victoria website. I had no idea there was anything like this close to Melbourne. Definitely worth a trip. I've lived in Melbourne 50 years and never been here I can't wait to go. Thanks for sharing. I wonder what the rules are with dogs? Havn't been to the Organ Pipes for a long time. Now that I have read the info. I have decided to go this weekend!